It’s summer! With new products coming on the market often, it’s time to review the best insulated stainless steel water bottle available. 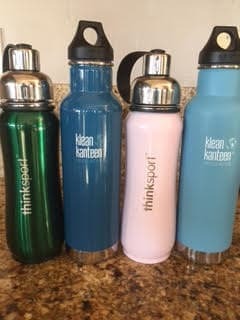 We chose the top brands to review: Thinksport and Klean Kanteen. It’s best to choose stainless steel bottles — whether insulated or not — because of their all-around durability. Unfortunately, we have yet to find a stainless steel water bottle that is made in America, although many glass water bottles are made in the US. Additionally, most of the stainless steel bottles have some plastic in the cap, even if it is just the plastic ring which helps the bottle to seal. Still, stainless steel is preferable to using an entirely-made-of-plastic water bottle. We’ve tried many insulated water bottles and our favorites are Thinksport and Klean Kanteen. Both of these companies give back with charitable contributions as well as offer superior products while making product safety a priority. Here are the pros and cons of each bottle. 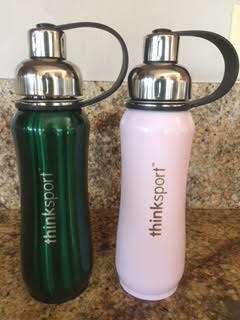 We were excited to try these new Thinksport water bottles. We wanted water bottles that were insulated and easy to refill so we tried the Thinksport Insulated Sports Bottles in the 17 ounce (500ml) size. These bottles keep water cold all day. Even on 100+ degree days, there is still ice in the water bottles hours later. Now that it has cooled off and I’m not adding ice, it stays cold for hours. When I used it for hot tea, the tea stayed hot for as long as I needed it to. The bottle is made with food safe, 18/8 stainless steel (304 grade). Thinksport performs extensive tests to ensure there aren’t toxic chemicals in their products. I love that this bottle does not have an interior plastic liner/coating over the stainless steel. It seems safer and cleaner to drink from, and it is safe for hot liquids. There are two twist on/off caps. The drinking spout on top is smaller. You can cover it with the mouthpiece/guard. The second is the entire cap which has a wider mouth which makes it easy to refill and also to clean. The contoured design makes it easy to hold while drinking. When walking or hiking with it, we tend to carry it by the loop handle. Both the drinking spout and the main cap are twist on/off so you can be sure they seal properly. 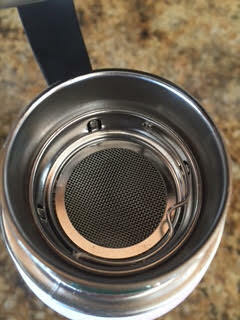 There is also a plastic ring inside the main cap to ensure it remains leak-proof. The bottle comes with an extra plastic ring. I mostly use this to tote water, and I love that there isn’t external moisture like with many water bottles. I have also used this a few times with hot tea and was stunned the bottle wasn’t hot. Your hands will be happy! While at home, I remove the larger cap and fill water directly into the bottle, not via drinking spout the way my kids do at school. They need to refill their 17 ounce water bottles several times a day being out for recess when it is 100+ degrees. It is easy for them to remove the covered mouthpiece/guard and refill it through the smaller hole. This is great because they can use one hand to hold the bottle and other to access water from the fountain. The mouthpiece stays attached to the bottle so they don’t have to hold it separately or put it on the ground while they are filling up. The mouthpiece can be covered when not in use. Until moving to Tucson we never needed to put ice in our water bottles. This stainless steel mesh screen has proven to be a great asset. You can drink without ice cubes falling out. The strainer has also enabled me to put a teabag in my water bottle, as it doesn’t interfere with my drinking. This is something I’ve never toted around before: iced tea and hot tea! Thinksport has taken this successful line and varied the sizes. Their Insulated Sports Bottle is available in 25 ounce, 17 ounce, and 12 ounce sizes and comes in a variety of colors. 10% of the purchase price of Thinksport bottles go to one of the following organizations: Pelotonia, Healthy Child Healthy World, Habitat for Humanity, and CureSearch. Our water bottles get so much use, and I believe it is easy to have bacteria build-up because it is difficult to thoroughly scrub out the bottles without a proper water bottle cleaning brush. And who takes the time to do that thoroughly everyday? Therefore, it’s a huge bonus when I can safely put water bottles and lids/caps in the dishwasher. The care instructions that come with Thinksport state the bottles are dishwasher safe but to remove collar and strap. We owned these bottles in the past and put them in the top rack of the dishwasher. The paint chipped off of them. If you buy one that is all stainless steel — no color, per se — this will be a non-issue. But it’s near impossible to remove the collar and strap. 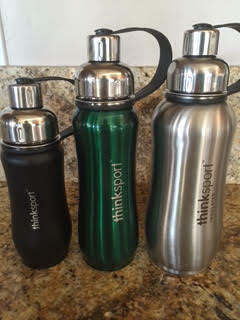 I have a hard time doing it so I haven’t put my new Thinksport bottles in the dishwasher. I’m also not sure if it is advisable/safe to put the cap in the dishwasher being there is the plastic liner. If you do, be sure to remove the silicone ring or it will melt over time. We also experienced this firsthand from past experience. What’s great is that Thinksport includes an extra plastic ring with each purchase. 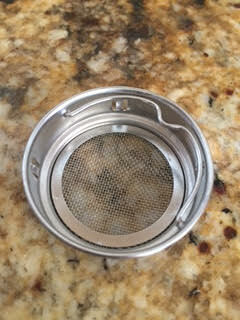 While the cap is made from stainless steel, it is lined with plastic as well. These bottles do not have flip-top lids which may or may not make a difference to you. If you want to use this while driving or while exercising, you will need two hands to unscrew it. Even though you aren’t drinking from the mouthpiece cap, it comes in contact with the spout your mouth drinks from, so you have to worry about washing this piece too. If you opt for the stainless steel one without the color, this will be a non-issue. You should wash the lid, mouthpiece, and mouthpiece cover by hand. Thinksport does perform extensive testing to ensure the safety of all of their products. I love Klean Kanteen water bottles and their concern for the environment. From their start, they offered high quality and safe products while encouraging health, sustainability and environmental awareness. One of my favorite things about Klean Kanteen water bottles are the different types of caps that are available and compatible with their water bottles. You don’t have to buy entirely separate bottles to take different drinks on the go. Their Vacuum Insulated Classic comes with their Loop Cap. Easier to drink from when walking, driving, and exercising as you can access it with one hand instead of two. This is MY FAVORITE because it’s made from 100% food-grade stainless steel. You can wash it in the dishwasher! No plastic will touch your drink! Therefore, this will be the first water bottle I own — and I own lots of them — that is made with almost no plastic (there is the silicone ring which helps seal it). This is my second favorite cap because only stainless steel, and not plastic, touches my water. It is made from sustainably harvested bamboo. You can turn your water bottle into a beer growler. I wish I knew about Klean Kanteen water bottles when my kids were small as I always gave them plastic sippy cups; I cringe now thinking about it. How I would have loved to buy a 12 ounce Klean Kanteen and used this child-appropriate lid! I’ve enjoyed using the different Klean Kanteen water bottles I’ve had over the years but I never tried one of their insulated bottles. Their Vacuum Insulated Classic is fast becoming one of my favorites. I own them in the 20 ounce size. It’s also available in 12, 32 and 64 ounce sizes and in lots of colors. I’m excited to say that IF YOU BUY THE BRUSHED STAINLESS STEEL bottle, it will be dishwasher safe — my dream come true! This means you cannot buy it in one of their awesome colors, but I really like to be able to put my water bottle in the dishwasher. 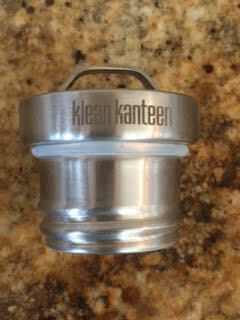 You can also put the Klean Kanteen stainless steel cap (sold separately) in the dishwasher too. Until moving here, I never cared about drinking very cold water. During the summer months here now, I do. I can attest that when I filled the water bottle with a lot of ice and then added water to take with me on a hike, I actually ran out of water because the ice didn’t melt! So keep this in mind… the bottle will keep your water cold! I used this to take coffee with me as well and it remained hot the entire time. They perform extensive testing to ensure their bottle are safe from toxins. 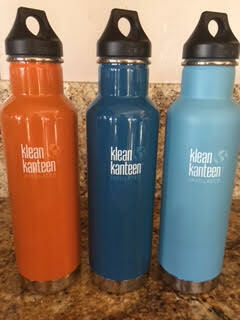 Klean Kanteen uses 18/8 food-grade stainless in their stainless steel bottles. Because these bottles don’t have liners, they are more hygienic and easier to clean. Only stainless steel touches your drinks so there isn’t an aftertaste. This bottle comes with the Loop Cap which makes it convenient to carry with a finger. It’s sleek, streamlined design fits in car and bike cup holders. 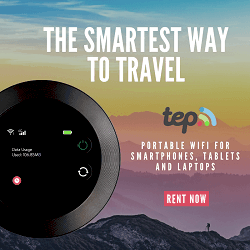 I’ve tried their Loop Cap, Steel Loop Cap, and their Bamboo Cap with the Insulated Classic. None of them leak as they all form a tight seal and easily twist on and off. I’ve used their Sports Cap with another one of their bottles and it works well too. My older Klean Kanteen stainless steel water bottles are very cold to touch when I fill them with cold water. I actually love this in the very hot Arizona summer, but I don’t like it other times of year. 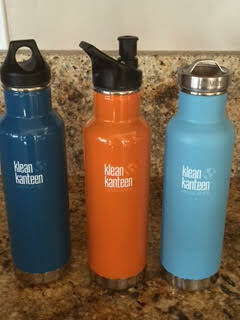 These from Klean Kanteen now don’t feel cold or hot, no matter what the temperature is of my drink. Your mouth only touches the bottle, not the cap (unless you buy the Sport Cap) so it is much easier to clean and more hygienic in general. These bottles are very easy to refill, even when dispensing the water from my refrigerator door. The mouth is wide enough to include ice (1.75″), and it’s wide enough to clean with a brush. I absolutely love that I can have a stainless steel cap to house my water. I strongly dislike plastic and so this stainless steel cap is a dream. It is dishwasher safe too! There is a size for every need, from your toddlers to the 32 or 64 ounce size for hiking or for your workplace. 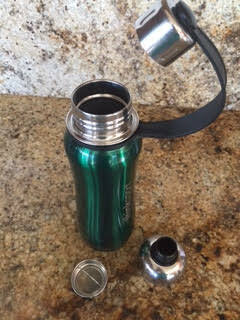 And by switching out the caps, you can change your classic water bottle into one for hot beverages. 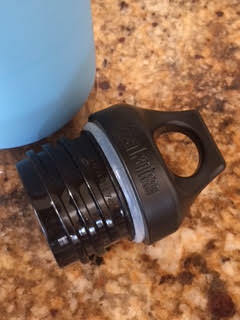 You can even convert your water bottle to a growler with their Swing Lok cap. 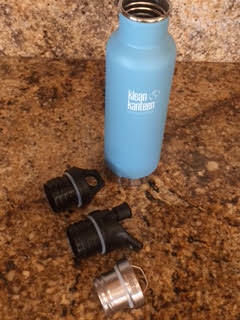 I intend on keeping my Klean Kanteen water bottles a long time but it is nice to know I can recycle them in the future. Their bottles are protected from manufacturing defects for life. Klean Kanteen created the #BringYourOwn campaign which brings awareness to the waste caused by single-use items like cups, plates, straws, disposable water bottles, etc. It encourages people to “bring their own” and to refuse these disposable items when out and about. Klean Kanteen is a member of 1% for the Planet in which they make a commitment to donating a minimum of 1% of annual sales to non-profits that protect, preserve and restore the environment. The Loop Cap it comes with is made from polypropylene, a type of plastic (though it is safe). Buy the stainless steel cap and this becomes a non-issue. Unless you buy the Sport Cap, you will need two hands to twist and open it. I love the colored bottles but they are not dishwasher safe. Buy the stainless steel water bottle if you want to put this in the dishwasher. They are responsibly made in China. We have yet to find a stainless steel or insulated stainless steel water bottle that is made in USA. When we buy stainless steel water bottles I think most of us assume they are safe, but how do you really know? You can be sure both Thinksport and Klean Kanteen test for the safety of the materials. Through thorough testing, these companies ensure their products are free from: PVC, PET, polyester, lead, cadmium, bisphenol-A (BPA), phthalates, and estrogenic activity. Who knew you could find all this in a water bottle? 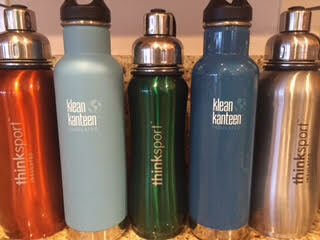 Thinksport and Klean Kanteen have made it their mission to make products safe. 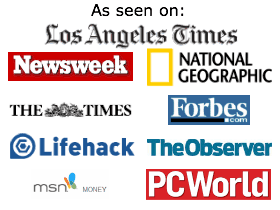 We’ve done many water bottle reviews as we are always using reusable water bottles. Learn more about glass water bottles, best insulated water bottles and best fruit infused water bottles. Looking for a water bottle with a filter? Read about some great ones here. While trying to live green and make earth-friendly choices when possible, reusable water bottles are essential. In some places of the country, like the dry southwest, people often carry water bottles everywhere they go. We bring them everywhere during our usual routines, and we always bring them on vacation. You never have to worry about stainless steel bottles breaking like with a glass water bottle. It’s good practice to avoid reusable plastic water bottles. Some reusable plastic water bottles, even when guaranteed safe from BPA, can deteriorate over time. You should never leave a plastic water bottle in the sun. The previous year, our go-to stainless steel water bottles were the Thermos Vacuum Insulated 18 ounce stainless steel bottles. However, within months of each other, all of our lids cracked. We weren’t able to find replacement lids, and I didn’t want to buy new bottles with lids that might crack again. I may have found my dream water bottles in Thinksport and Klean Kanteen. I’ve enjoyed using these brands before and wanted to see what products they have improved upon. Both companies offer the best insulated stainless steel water bottle. Read about Yeti vs Ozark Trail and easy ways to go green at home. Hands-down, I think they make the best insulated water bottles. We bring them everywhere we go, especially on vacation. I can drink hot or cold liquids without burning or freezing my hands, and drinks stay hot and cold for as long as I need them to. I can put both brands’ all stainless steel bottles (ones without color) in the dishwasher without worrying, and I can feel good knowing I am refusing single-use bottles. Cheers to enjoying the best insulated stainless steel water bottle.